A PROJECT is underway to re-introduce an extinct farmland bird to Inishowen. A number of leading agencies and local clubs are involved in the 'GLAS scheme for Grey Partridge' at Burt and Inch. Interested parties are invited to attend an information session and walk this week in the designated area. The grey partridge is a locally extinct farmland bird "of traditional importance within the Irish countryside". 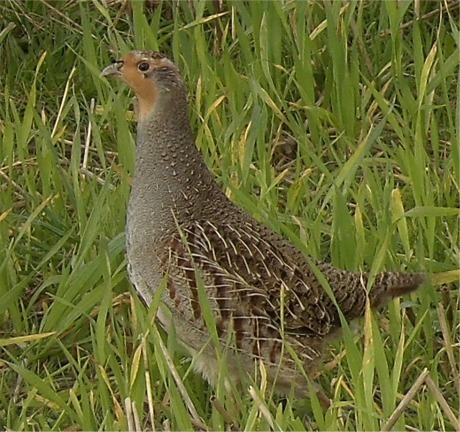 The Department of Agriculture, Food and the Marine (DAFM); the National Parks and Wildlife Service; the Heritage Council; Inch Island Gun club and their parent group the NARGC are collaborating in the re-introduction programme for the game bird which is a member of the pheasant family. A beautiful grey partridge is released at Inch under a new GLAS conservation programme. Local farmers who are currently participating in the GLAS scheme are also invited to attend to find out what conservation measures they must comply with in order to draw down GLAS payments and Glas Plus payments under the new scheme. The GLAS Farm Walk will take place at Bryce's Farm, Strahack, Inch Island on Wednesday, July 6, 2016 at 6pm sharp. The DAFM thanked the Bryce family for making their lands available for the event. Walk participants are asked to wear suitable clothing and footwear. Meanwhile, more information on the partridge programme is available at www.inchpartridgeproject.com .